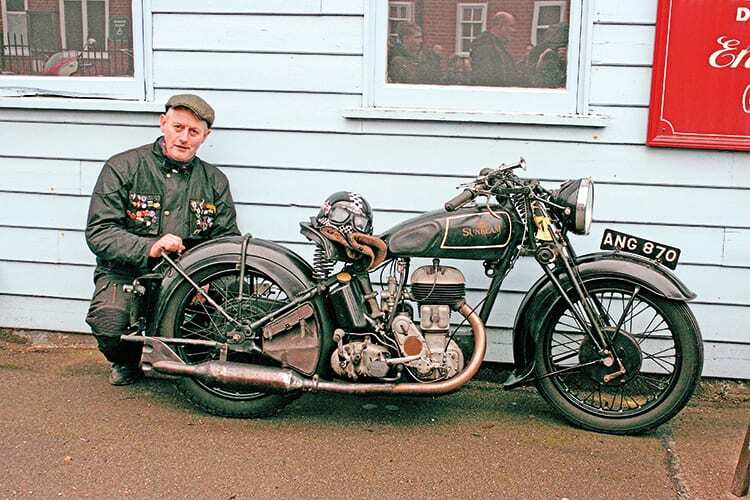 Stuart Osborne and his Sunbeam lit up the gloomy January weather. Brunch for more than 5000 seems a vaguely biblical feat, but it sums up the efforts of Brooklands Museum for its New Year’s Day Classic Gathering, billed as the largest such year-opening event. Whatever the excesses of the previous night, when the gates opened at 9am it started a seemingly never-ending stream of classic, vintage, veteran, commercial and military machines as well as more modern custom creations. The museum had laid on plenty of additional catering to keep everyone refreshed. Eventually, there were more than 1100 pre-1988 admissions. The parking area was provided by the former finishing straight, part of the original track, and finally revealed after the removal of the wartime Bellman hangar. It was a considerable space, but soon filled with cars. The motorcycles had their own dedicated area near the famous clubhouse. A line of two-wheelers by the BP pagoda was dominated by BSA and Triumph examples, while there was more variety in a row by the nearby paddock fencing. Sad to admit, but the two-wheeler presence was decidedly modest in numbers compared to other types of vehicles. The Campbell Shed is part of the original track infrastructure. A period enhancement was a Sunbeam Lion leaning against it. The bike had been ridden in by Stuart Osborne. He had bought the 1936 model, apparently an uncompleted restoration, from a Kempton Park jumble. Damage to the 600cc side-valve engine took some specialist repair to get it up and running, but the cycle parts were an easier prospect, needing little more than basic recommissioning. That authentic patina was already there.